…an ongoing course of learning for children and adults alike! Though directed at kids, Herbal Roots Zine is IDEAL for adults. I love how it keeps things simple, and I love the great, beautiful art. Probably the most important thing that can happen in the field of herbalism is that it be passed along, as it has always been, to younger generations. How much more natural to grow up learning about plants as medicines, and seeing the interdependence that is nature expressed in our daily lives? Herbal Roots Zine helps to achieve this; helps to make it easier for those of us who weren’t taught about herbs as kids to teach our children. That it’s created by someone as cool as Kristine, who lives and breathes it, is the flower on top. 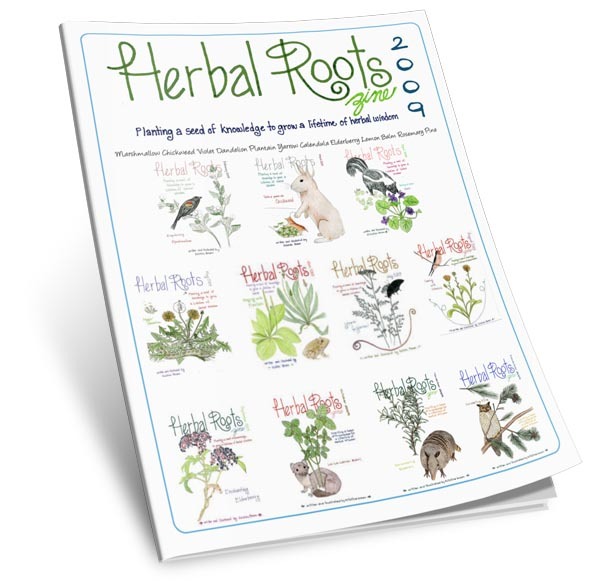 Herbal Roots zine is a lovingly handcrafted homespun herbal publication. Are you looking for a course to teach your children about herbs? Want to learn about herbs with your child? Want an easy format to teach yourself or your kids about herbs that makes sense and actually clicks? You’ve come to the right place! Herbal Roots will give you the tools necessary to make herbal learning easy, fun and memorable. And the best thing is, it’s affordable!! Each issue of Herbal Roots zine is beautifully illustrated. Author and illustrator Kristine Brown uses vibrant color pencils and water colors to bring her illustrations and the plants alive. Plants are lifelike and well represented. How much would you pay for a year’s worth of Herbal Roots? An informal survey advised me folks would be willing to pay up to $10 per month for something of this caliber! And yet, I’m offering you a year’s worth for only $34.97!!! You read that right, 12 issues of Herbal Roots zine for $34.97 sent directly to your email inbox. Individual issues are $7.99 each but you can save almost 60% off the individual pricing by subscribing for a year. With your subscription, you’ll receive the entire 2009 archive in addition to a year’s subscription! 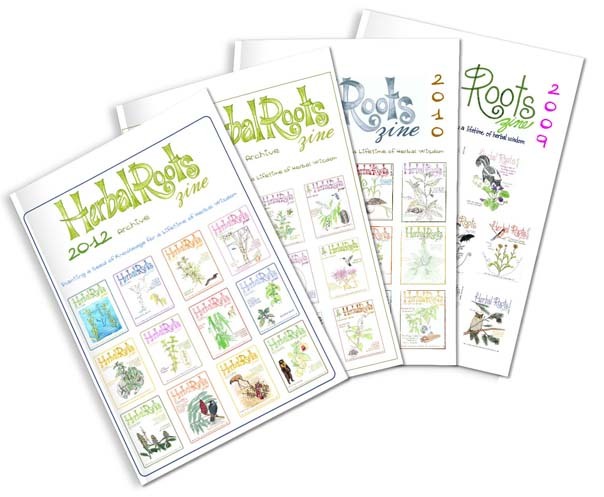 23 issues of Herbal Roots for only $34.99, that’s only $1.52 per issue!! We’re also giving one year subscribers a 56 page ebook titled Healing Herbs eBook from LearningHerbs.com valued at $27 free with your annual subscription! 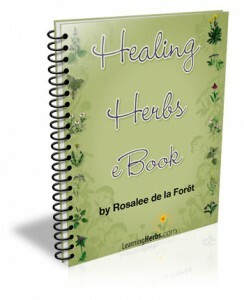 This ebook contains information on 23 herbs and a simple remedy or healthful recipe for using each herb. Herbs covered are: Astragalus, Burdock, Calendula, Catnip, Chamomile, Comfrey, Dandelion, Echinacea, Elder, Garlic, Ginger, Hawthorne, Lemon Balm, Nettles, Oats, Peppermint, Plantain, Red Clover, Slippery Elm, St. John’s Wort, Valerian, Wild Rose and Yarrow. 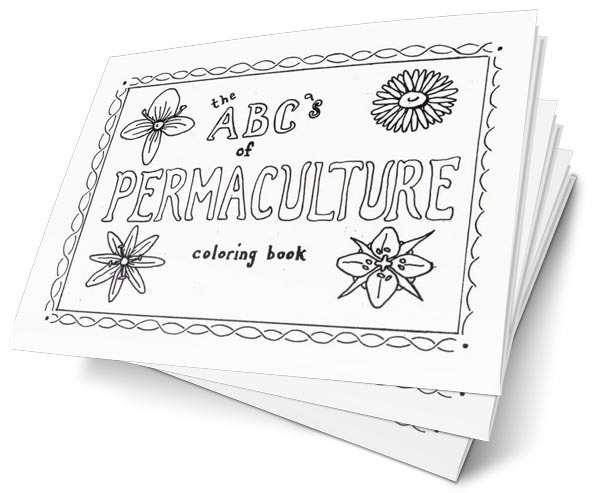 This beautifully illustrated permaculture coloring book is 28 pages in length and contains information on herbal medicines and permaculture. Hand written by Roman Shapla of The Children’s Permaculture Guild and Kurent Journal: a seasonal journal of permaculture-based articles, activities, and games for kids. This collection of crossword puzzles, word finds and word scrambles has never before been offered as a complete package. 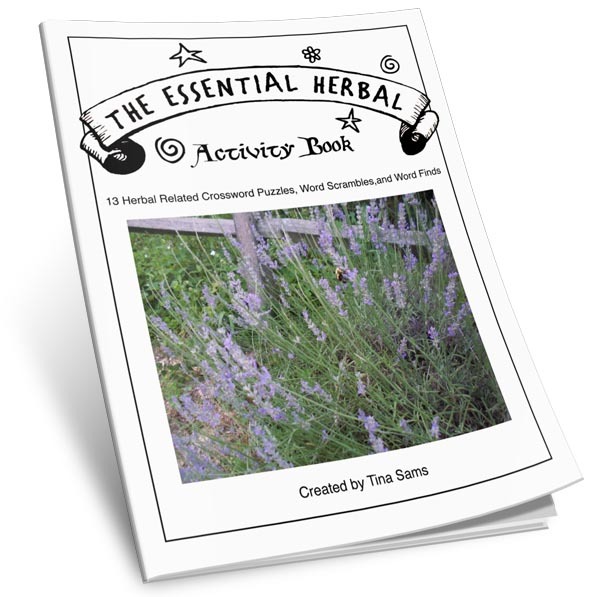 Made by The Essential Herbal creator and editor Tina Sams, this activity book provides 13 different puzzles and the answers to a unique collection of herbally oriented topics. That’s $199.88 worth of herbal learning for just $34.97! You can’t beat a deal like that. What are you waiting for?! Subscribe now to get these great deals! Click here to order by check or money order. Please allow up to 24 hours to be placed on the subscription email list and to receive your first PDF issue of Herbal Roots and download links. Subscriptions start with the current issue and run for 12 consecutive months. Please note this is a PDF zine only and you will not receive a paper copy of it. You are welcome to print off as many copies as you need for your own personal use. Another idea we recently had from a different project is to comb-bind the pages after printing; then they can be on the shelf individually. Hello. I have been printing the archives via Herb Fairies. It’s so costly. I would be happy to pay more for print issues. Thank you and love your magazine. Hello, with the subscription are the 2009 editions that are included the revised updated issues? Hi, just want to learn it for myself right now. Hope thats ok. Don’t have any kids yet, but want to be prepared for when I do. Hope that’s okay. Thank you, Shawn.